Stay organized with our mortgage borrower marketing and partner management software. Stay top of mind, and stay converting. Use borrower and partner pipelines to organize everyone you communicate with by what part of the loan or partnership journey they are in. How Do I Manage My Borrowers & Partners? There are so many channels these days to communicate and market to leads & partners. What’s most important is to have a piece of software that ties all of these channels together. 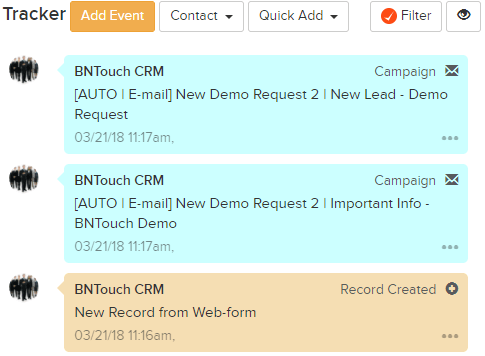 A powerful CRM like BNTouch can be the glue that keeps a mortgage business on track and organized. As potential borrowers move through their customer journey, organize them by their stage in the pipeline. Leads, prospects, applications, in-processing, funded, cancelled or follow ups stages allow for clear segmentation. Stay up to date with where all borrowers are in the loan process. Craft messaging to fit with where a borrower is in their journey. Never again miss a call with a prospect or an opportunity to congratulate a past borrower on their loan anniversary. Track all communication with a borrower from the moment they fill out a website form to their 10 year loan anniversary. See what’s been said, sent and replied to and easily pick up right where you left off. You can even make notes if there’s something to remind yourself of. Learn more about the tracker here. BNTouch is equipped with an intelligent lead intake and distribution system. Once a lead is received, the distribution engine will read the information associated with that lead and determine which LO or sales agent to assign that lead to. To get repeat business make sure clients are impressed with their service during the transaction. BNTouch allows gives the ability stay on top and immediately notify borrowers, Realtors and other participants about status changes on their loans. With our partner portals and app, partners can submit new leads right into BNTouch. See status updates and submit feedback from their own custom branded online portal. Realtors love our partner portals and apps because they have constant access to all participated transactions. As well as immediate notifications about status changes in transactions and updates from Loan Officers. This feature WILL make you stand out! From the moment a business card is collected until they become a preferred partner, keep partners organized with these pipelines. Business card collected, interested, active partners, preferred partners, terminated, vendors and even friends & family pipelines can help target the messaging, marketing and increase referrals month over month. It is proven that partner referrals increase when there is an organized system in place. Use a system to stay organized and communicate efficiently during the process. BNTouch allows not only that, but also track referrals both ways to see which partners are a quality referral source. Discover your most active partners and start to solidify relationships with them. BNTouch has all the tools needed to build a successful business that does not rely on buying leads. and partnership management can do for your business?